The system centers around a pressuried tank filled with negatively-charged resin beads, which interact with untreated water to draw off undesirable minerals. A backwash cycle rinses away the captured minerals, followed by a regeneration cycle that recharges the beads with a brine solution. The entire process is managed by a precision engineered water valve, which works in tandem with a computeried controller to treat your water with maximum affordability and eco-friendliness. Coolabah Water systems are designed to deliver reliably high volumes of treated water over a lengthy working life, thanks to features that improve performance and durability. Frictionless seal valves keep untreated and treated water completely separate. High flow design means less pressure drop when demand surges suddenly. Tough reinforced thermoplastic construction won’t corrode, and is certified for material safety. Intelligent cycle controller governs system cycling to provide many operating advantages. Choose the time clock mode or the environmentally friendly on-demand mode that regenerates only when needed, saving water and regenerant. Automatic power backup means no resetting in a power failure. Smart 28-day Variable Reserve feature “remembers” your usage pattern and adjusts to demand variations. Control panel with a large LCD makes it easy to change settings. Many homeowners choose to further enhance their home’s water supply by adding a drinking water filter system for whole of house. A Coolabah Water filtration system can greatly reduce the contaminants that make water taste and smell bad. Some systems also reduce waterborne chemicals that may be harmful to your family’s health. We can install a drinking water solution to serve an entire home, or you may choose a point-of-use product that improves only water used for drinking and cooking. A new carbon filtration or reverse osmosis water system delivers safer, fresher, more flavorful water for a few cents a day. You can say goodbye to costly bottled water, along with the waste from endless plastic bottles. Conditioned water makes home life easier and more economical to live. The benefits include reduction of soap scum and scaly skin to higher water pressure and extending the life of your hot water system, washing machine and dishwasher. A water softener will save significantly year after year on the cost of cleaning by reducing the amounts of soaps and detergents you need to clean with. This will also help the planet and reduce the damage that they cause in the environment. Suds galore whenever you shower or do household cleaning chores. Beautiful hair with more luxurious volume, softness and manageability. Sparkling dishes and china with no filmy buildup, while using half the dish soap and no dishwasher rinse additives. No more scrubbing to remove water scale deposits from sinks, tubs, toilets, cutting boards and counter tops. Soap savings of up to 50% on laundry detergent, dish soap, shampoo, fabric softener and more. Energy savings by improving water heater efficiency nearly 30%. Fluffy towels and cleaner clothes that look brighter, feel softer and last longer. Cooler ice cubes that freeze clearer and harder for more attractive drinks. Appliance performance improvements in dishwashers and washing machines… no more water scale buildup on internal parts. Cleaner, clearer plumbing that works easily, clogs less readily and maintains full pressure longer. At Coolabah Water we can engineer a customised water treatment system for your home, adjusted to your personal water usage and the chemistry of your local water. It’s a complete system, with each component carefully chosen, assembled and installed to provide plenty of clear, convenient treated water. 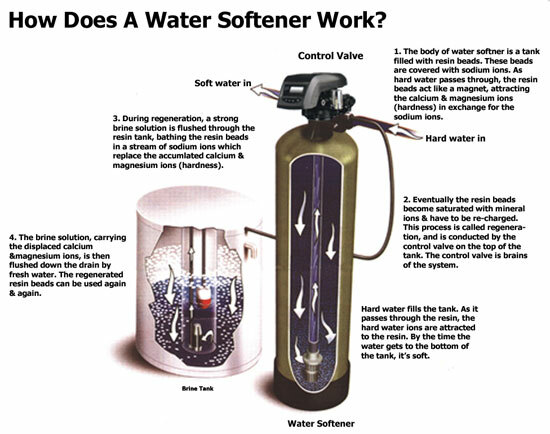 What Capacity Water Softener Do I Require In My Household? Capacity is one of the first things you need to consider in a water softener. The average family uses 1500 litres of water per day. What Difference Does A Softener Make? No more soap scum in fixtures & appliances. Clothes are softer and cleaner. Dishes will be clean and spot free. Appliances will last 45% longer - Hot Water Heaters, Dishwashers, Washing Machines and Kettles.